traducción. fr. desde mi corazón. translation. ph. from my heart. APR 18 Volunteer at AIA Central Oklahoma Downtown Metropolitan Library LEGO Club presentation. DEC 13 The Boxyard Grand Opening: Building kits from LEGO Architecture – The Oklahoma Series in Tulsa are exclusively sold at Dwelling Spaces. APR 20-APR 23 Special Exhibit of LEGO Architecture – The Oklahoma Series Models at the inaugural Architecture and Design Film Festival Tulsa at Circle Cinema. I am thrilled to have joined 360 Engineering, but I am also very grateful of the many opportunities that Wallace Engineering provided me to grow and develop into the structural engineer I am today. Here is my portfolio of my favorite work of my career so far. I carry the same energy and level of creativity to my new job. I am most excited about building the culture of a young and new firm. Cheers to new beginnings! As you have probably noticed, I have become a little carried away with the whole Lego thing. Katy was gracious enough to gift the Lego Studio set for Christmas and it was a complete game changer for me. I started with an idea of creating microscale architecture from my own inspiration, but I needed to start with something familiar so, naturally, I started by modelling buildings in which I had been the project engineer. I soon realized was that building with the constraints of having an existing mass and geometry was much more challenging than free building. Which, of course, made it more fun! Last Thursday I went back to school with freshman students enrolled in ARCH 1112 - Intro to Arch. Yes, you read that right. They sent me all the way back to freshman orientation! This time however, I presented myself as an OSU Alumnus working in the professional ARCH/AE community. At first I thought to myself, what could I possibly have to offer will only 2.33 years of practice? Am I qualified to do this? I started reviewing my experiences as Wallace Engineering. I was really surprised to find out I have worked on almost 170 different projects since I joined Wallace in June 2012. That is almost 73 projects/year! Even though most of them had relatively small scopes, or I was part of a larger team, that is a lot of projects! I have worked on all aspects of design projects: schematic design, design development, construction documents, construction administration, construction observations, and special inspections. That is a lot to learn in a short amount of time. Out of college there was a lot of ground to cover, and there is still more to study before licensure exams. Wallace has provided invaluable resources and experiences helping me develop as an EIT. For that I am very grateful. OK, so maybe I did have some good experiences to share. Upon arrival to the School of Architecture, I instantly recognized a familiar face. My good friend Taylor, an OSU grad student in Aerospace Engineering, whom I first met at an OSU engineering summer camp (REACH) in 2006 was visiting his brother Austin, a current Architecture undergrad. I could not believe that after 8 years we would still run into each other on campus! It really made me think of how quickly my time at OSU passed by! After catching up with Taylor and Austin, I made my way through the ARCH building to visit with AE professors Carisa and John. I owe my success to them and many of my OSU professors for challenging me. All the professors in the OSU School of Architecture are truly outstanding. After visiting their offices, I journeyed around the studio spaces. There is always exceptional level of creativity here. Out of college, I have developed a critical eye for efficiency, constructability, and simplicity, but I forget to exercise my creativity. It was incredibly refreshing to see these young designers really pushing the limits of Architecture. I also became a little nostalgic about my own days in design studios. There are a lot of great friendships and memories there. Soon after, I welcomed my freshman orientation students. With the understanding that most of these students were discerning their majors, I tried to engage them and encourage them to find their calling in life. Architecture and Architectural Engineering are great, but so are many other fields. The professional field is very demanding but also very rewarding. I shared a few of my experiences in the professional world there seemed to be more questions about my experiences in college. I think I enjoyed sharing those stories even more. It gave me a chance to relive some of the best parts of college life. And I did exactly that when I visited my old roommates Brian, James, and Paul. I finally got a chance to "get the band back together" and play some great music. Even though we are not the most talented group of musicians out there, when I play with the "Satalite Lazorz" (look them up) I really feel that I can communicate myself emotionally through music. That is something, that I have not been able to fully experience when I play solo. The band, and the group of friends centered around the band, along with the studio community are probably the aspects of college life that I miss the most. It was awesome to rekindle my spirit of creativity and enthusiasm as a student. I hope the freshman students find their passions in life. If they choose to continue in the school of Architecture, I hope they learn to love the enriching environment. It was an honor to visit my Alma Mater, and I can't wait to go back again soon! Katy threw an epic party, and I can't thank her enough for planning it all out! She made an italian cream cake, a fresh fruit tray, and fajitas for our guests. She even went out of way to learn how to make papa a la huancaina and causa rellena con pollo! I also have to thank my sister for making her awesome cucumber salad and my mom for making her delicious ensalada rusa and flan! This was the first party we had hosted since our post wedding party. The middle leaf was added to the dining room table, extra chairs were brought into the living room, and the patio furniture was set up. Even though it was about 1/4 of the size, everyone made us feel so loved. And it was also a lot more manageable! Good times were had in good company. Then the candles were lit and the "Happy Birthday's" began. It was at that moment that I realized how truly blessed we were. I was blessed with 10 months of having Katy as my spouse. My Mom was blessed with another cancer-free year. My Dad was blessed with an another injury-free year. My sister was blessed with another successful academic year. And the list go on...I began to reflect on past years, and think about future ones. Towards the end of the day, we took a walk to the park. Our attention shifted over to my Dad and my uncle Lorgio as they broke out in a friendly twig duel. Their shuffle seemed to have come straight from a "Three Stooges" skit, and the laughter was really contagious. I had to try it, so I challenged Pedro next. 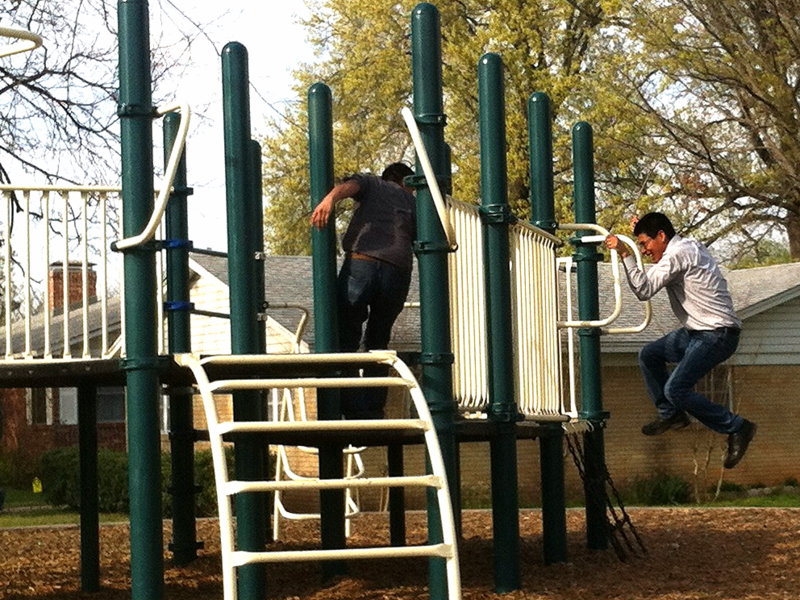 It was great to run around the park like a kid again. And from seeing my parents and uncles try, I would say they thought it was great fun also. I suppose it's one of those things won't change with age. Each year, what we hope for is love, life and happiness. We experience this in different ways. Perhaps in dinner company with old friends. Perhaps in receiving news of a daughter's pregnancy. Perhaps in consoling a brother during a time of loss. Each one of these moments is an opportunity to give thanks to God. Never take it for granted! To all of our family and friends that stopped by, thanks for spending time with us! And those that couldn't make it, we hope to spend time with you soon! "Never mix business with birthdays"
It has been another fantastic weekend for Katy and I. We owe it all to God, our friends, and our family. We started off our Saturday in Edmond at Ben and Makayla's wedding shower. It was truly a blessing to witness the warmth and love shared by their family and friends. In a special way, Katy and I were reminded of the family reunions, family extensions, and new friendships that blossomed from our own matrimony. We have no doubt that Ben and Makayla will have a successful marriage and we can't wait to see them take their next step forward into each other's lives. After our visit in Edmond, we called up the other Montoya's (my parents, Nestor and Gladys) for a reunion! Katy and I are making it a practice to treat them whenever we visit. We took them out for ice cream at Kaisers, an afternoon drive through Midtown, Automobile Alley, Heritage Hills, and Mesta Park and Oklahoma City University neighborhoods, and finally dinner at Big Truck Tacos (there is a tremendous amount of energy that is transforming the landscape of Oklahoma City, but this must be saved for another post). Katy and I learn something new every time we visit my parents. It can range from something as serious as how to maintain expense records for income taxes on investment properties, to something as silly as "Never mix business with birthdays" as my dad gave his simple explanation of a good work-life balance. It is the life experiences they share with us so openly that makes them such great life mentors. We love them dearly. Sunday came around with spring in full swing. We took full advantage of the weather walking to and from Mass, eating lunch on the back deck, and walking around the neighborhood and park. A new discovery we made together was Supermercado Morelos. From outside the store we could smell aromas of marinated grilled meats. We opened the door and a blast of cumbia music hit our ears. The customers and employees all greeted us in spanish with big smiles and there were aisles on aisles of unique imported goods. I felt as if I had been transported to the only familiar place I know with the same characteristics: Peru. It got Katy and I excited about our trip this coming May. This is definitely our new go-to store for Latin American ingredients. I love sharing my life with Katy. Her joy is my joy. I feel recharged and ready to take on the challenges of next week.